It took Maema Mmonwa 14 years to get a good job after finishing matric in the early 1990s. He grew up in Kanana, a small village near Polokwane in Limpopo. In 1993, Mmonwa passed matric with university exemption, but had no money to continue his studies. He found himself at home herding his father's cattle. "It was the most frustrating time of my life. Here I was, 17 years old having passed matric with good symbols and yet I was herding cattle," he said. Mmonwa later decided to join his uncle in Gauteng to look for a job. He found a job at a low-cost housing construction site near Eersterust, earning R18 a day. "It was physically punishing work. We had to dig foundation trenches for the houses using pickaxes. Some of my fellow workers would ridicule me asking what I was doing there if I had a good matric pass." At first he stayed in a hostel in Mamelodi, but moved to an informal settlement near Germiston. He then found a job at a gardening firm mowing lawns for R220 every two weeks. His financial position improved a little when he worked as a security guard for a while earning R820 per month. In October 1998, he was almost killed by striking workers at a dairy company where he was accused of being a "scab" (casual) labourer. He was assaulted and left for dead, but recovered in hospital. In 2000, a friend told Mmonwa about the National Student Financial Aid Scheme (NSFAS). He applied for a bursary and was accepted at the University of the Witwatersrand (Wits). In 2001, he started studying for a BA in social work. "At first it was hard to concentrateon my studies as I had been out of school for too long. But I didn't want to go back to the difficult life I had and put in an extra effort to succeed." In 2005, he completed his studies with outstanding results, which earned him three merit awards. 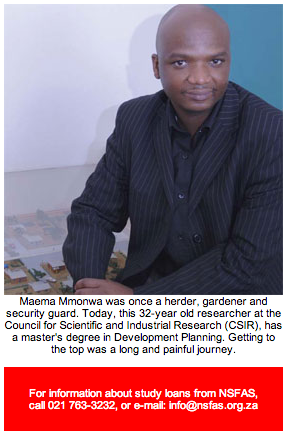 Mmonwa went on to study for a master's degree in Development Planning at the Wits School of Architecture and Planning. On completing his studies in 2007, he got an award as the best student. In December 2007, Mmonwa was appointed as a researcher at the CSIR's Built Environment section. "It has been a 14 years of agony, pain and frustration, but I never gave up. Although at one time criminal gangs asked me to join them when I was still living at the informal settlement, I refused because I knew that in life there are no short-cuts to success."